Don’t you work in 3D? 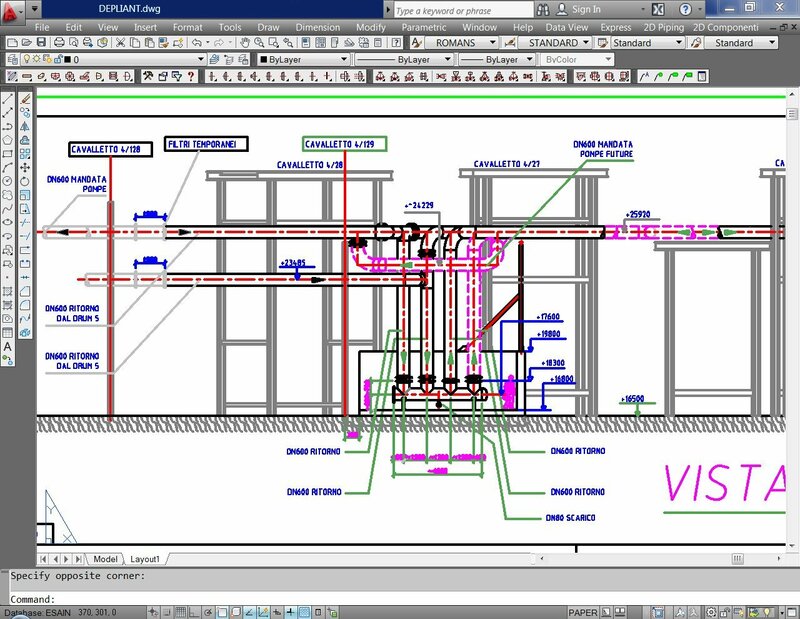 ESApro 2D Piping can help you draw plant layouts and also to intervene on projects carried out with the simple AutoCAD. absolute precision when positioning the components on the line thanks to functions of snapping to the nodes of the pipe line or of the existing components (pipe-snaps). ESApro Piping 2D is a very useful tool for plant lay-outs for all those who are not used to operating in a three-dimensional environment, even for users having only a basic knowledge of AutoCAD. In particular, ESApro 2D Piping is very helpful when modifying 2 dimensional drawing available in standard DWG format. The ESApro 2D Piping catalogue provides more than 10.000 piping components, organized in 1,500 dimensional tables, all conforming to the most widespread standards (such as ASME, ISO/DIN/UNI, BS, BPE etc.). Beside the conventional components, a catalog of components in PVC and PTFE, fiberglass, sanitary and Victaulic components, are also available. ESApro 2D Piping includes a module for the fast drawing of structural steel. Thanks to rapid and intuitive interfaces it is possible to manufacture beams (IPN, UPN, IPE, HE, LEQ etc.) extracting them from a customizable catalogue and then adapting them to one’s own needs by means of simple shaping and editing commands. ESApro 2D Piping is equipped with a parametric library of pumps, tanks, heat exchangers and other devices that can be represented from any viewpoint whatsoever. Based on the standard Microsoft SQL Server, the project database is shared by all the P&ID diagrams, the 2D Piping models, the isometric drawing and the electrical design environment. The “Publish” command transfers all the data present in the drawing into the database, making this data available to all of the project tea. Thanks to the “Line Manager” tool it is possible to keep the project lines under control in real time, giving the process manager the possibility to intervene on the process data in a simple and immediate fashion. The “Compare” function allows a constant verification on the congruence between the process scheme and the 2D model. no additional object enablers or conversion tools are therefore required to open or view such files.